Admittedly, I am not the biggest Apostle Paul fan in the world, as I tend to hang out biblically in the Gospels more than the rest of the book. Though Paul's epistles are interesting in a historical sense, I believe Jesus' message and witness as revealed in the Gospels offer more spiritual and religious fruits than Paul's writings. My personal belief is that modern Christianity places too much influence on Paul than Jesus. For example, many Christians believe Paul offers an example of how to apply Jesus' teachings. What these Christians often neglect is that Paul wrote these letters to a specific group of people at a specific time in history-not to the modern Christian. Christians already have a timeless and universal message in Jesus Christ, but they often fail to see this. Instead, these Christians prefer to cling to Paul because he tells them what to think and do. Despite these beliefs, I was eager to read RW Holmen's A Wretched Man because I wanted to see a unique and different Apostle. If one were to listen to the fundamentalists or evangelicals (or I suppose many mainstream denominations), Paul is this iconic traveling preacher & teacher who is founding new churches in hostile environments and expanding Christianity to both Jew and Gentile. While Holmen does present Paul in this form, a complex human side of Paul is also offered for consideration. Holmen's Paul is a conflicted gay man trying to reconcile his sexuality with the teachings of the Torah. This conflict is always with him as he also tries to deal with his role as an evangelizer to the Gentiles. This role also causes conflict with the Jewish Christians led by Jesus' brother James, who are also conflicted with being Jewish and trying to figure out Jesus' message and role as Messiah. Holmen captures all of these conflicts and provides the reader with a comprehensive view of how organic and often chaotic life was like for the early Christians. Aside from Paul's sexuality, which will undoubtedly anger literalist evangelical and fundamentalist Christians, A Wretched Man has another potential controversy: Paul's apparent Lutheran bias. Paulos gestured with an open palm toward the Gentiles lining one wall of the chamber. We know that a person is justified, not by the works of Torah, but through faith in Iesou Christos. And we have come to believe in Christos Iesou, so that we might be justified by faith in Christos and not by doing the works of Torah, because no one will be justified by the works of Torah. “I don't understand this idea of justification,” said Jason. For the final keystone course in my undergraduate program, I wrote a paper on the Joint Declaration on the Doctrine of Justification, which is an agreement between the Lutheran World Federation and the Roman Catholic Church about justification. Both denominations, fueled by biblical contradictions and rhetoric from the Reformation, came to a common agreement on justification in this document. However, this is not a legally binding agreement and large factions in both denominations continue in their original beliefs: Lutherans believing justification by faith alone and Catholics believing a combination of works and faith is needed for justification. I bring this up because I find it odd that Holmen chose to mention this specific theological concept more than once. It's not something typically mentioned unless being spoken of by Lutherans. As a former Catholic educated in theology by Lutherans, I find this mention, along with the entire book, very interesting. Of course, my belief that Paul-not Jesus-is what many Christians desire and choose to follow still stands. If anything, this book reinforced that idea simply because of its?existence. I plead guilty as charged; I am a Lutheran. But, there is a certain irony in your use of two quotes to suggest that I make Paul to be Lutheran as well–both of your quotes contain Paul’s actual words. Check out Galatians 2:15 and the verses that follow. Perhaps the doctrine of justification is more Pauline than you realize. You suggest that it is your personal preference to pay attention to the historical teachings of Jesus contained in the gospels rather than the Pauline theologizing of his occasional letters. Thus, I was disappointed that you failed to appreciate much the same point of view as one of the novel’s main themes. That was precisely the nature of the dispute between Paul and James in the novel. Perhaps your failure to identify this essential point of agreement with your own views is an indictment of the novel moreso than your review. Thank you for your comment. I’ve struggled with your comment and what to make of it. I do understand justification being a Pauline doctrine (it slapped me in the face when I wrote my paper), but I also know Lutherans focus on justification as a major point of their theology. It’s the choice and necessity to focus on the Pauline justification doctrine that interests me. It almost seems counterproductive given the simplicity of Jesus’ teachings. However, I know the context of Luther’s rationale in focusing on it during the Reformation. Perhaps a better way for me to approach this is to ask this question: Is Paul a Lutheran? Just finished the book ”A Wretched Man”. Stunning by all means. 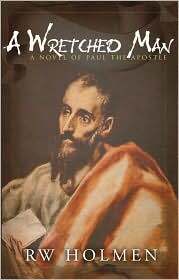 The fictitious novel also speaks about the volume of study, research about the Apostle Paul & his time and culture done by Sir Holmen. It truly inspires you to rethink about the giant Christianity leader. As you read on you will experience your own self walking on the roads of Antioch, Damascus, Jerusalem & other far regions. I sincerely wonder how Paul managed to do such an emphatic spiritual work in his time when there were lots of chaos, confusions, worldly attractions !!! But we can understand that without God & help of Holy spirit & mercy of Lord Jesus Christ it would have been impossible to accomplish such a work. As you read this breathtaking novel you surely get to know about the real time difficulties Paul faced. And when you think about yourself in that context it will definitely leave you all energetic and inspire for the work of God in this present tough time. The debates between Paul Apostle & James, Lord’s brother. Whenever these two people meet in the novel, my heart was at standstill. But I feel if these debates have been more intensified it would have been more enjoyable. Think Paul quoting Jesus’ words spoken during His life & James quoting law. Then again Paul arguing from the same Torah, from Prophets’ words and s on. Then these confrontations would have been more interesting & en lighting. I feel somewhat incomplete whenever these two greats complete their meeting with few discussions even words. Then again it would have been more strengthening to see Paul’s determination & commitment towards Lord during his difficult jail times. We nowhere see in the Bible about bribe or else used for personal escape. Instead Paul was all charged up & joyful for Lord’s work also in jails. But then we get to experience Paul’s real fears in prison, his doubts or questions about his state. All is awesome. And for all who are fearing about the gay angle. Just ignore the related passages of the same to enjoy this great work (as also I did). A wretched man of God indeed !